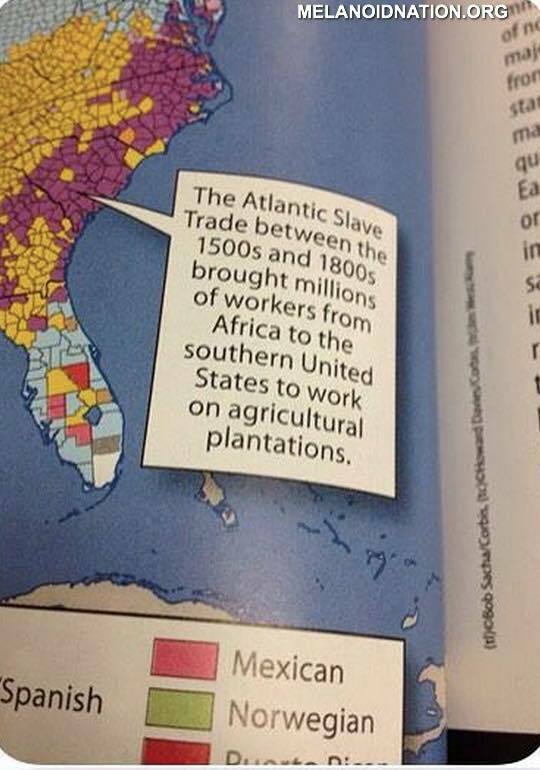 McGraw Hill publishers recently put out a history textbook approved by the state of Texas where the trans-atlantic slave trade is painted more as a migration of workers than a culture-stripping death voyage where survivors were forced to jump start the engine of capitalism or die. It was not until a parent, Roni Dean-Burren, objected to the characterization that McGraw Hill admitted they could "do better" in communicating the facts about slavery in this country. It is rare the textbook that actually gets it "right" when it comes to describing the ramifications of the slave trade on people of African descent, however this case is among the more egregious. There are many astute people who lend their brain power to the creation of a textbook, and to believe that something like this is just an oversight is a stretch at best. I am at the point now where I no longer expect those who guide the institution of education to accurately tell the stories of underrepresented minority groups. It is simply beyond the scope of their mission. At its best, American public education was designed to develop an informed citizenry so that the democratic process at the foundation of the country could flourish. At its worst, public education serves to maintain a status quo of haves and have nots so that the bourgeoise will always be able to depend on the proletariat to do the work necessary to uphold their way of life. Those who manage to combat the oppressive nature of public education manage to do so by augmenting what is offered in school through alternative methods. Most notably I think of Chinese communities in America whose children attend weekend schools so that they have a full understanding of their language, history and practices. I have seen the same model employed by both Russian and Jewish families as well. There are great African-centered rites of passage programs that need to be scaled up in response to the continued revision of the history of African descendants in this country. It is the only way the story will be told properly. One of favorite college professors, Dr. Howard Stevenson, would often say in class, "The lion's story will never be told as long as the hunter is the one to tell it." More important than anything else, this most recent example of whitewashing the history books further motivates me to act and I hope that for all those who have read about this and other incidents, that they will do the same.